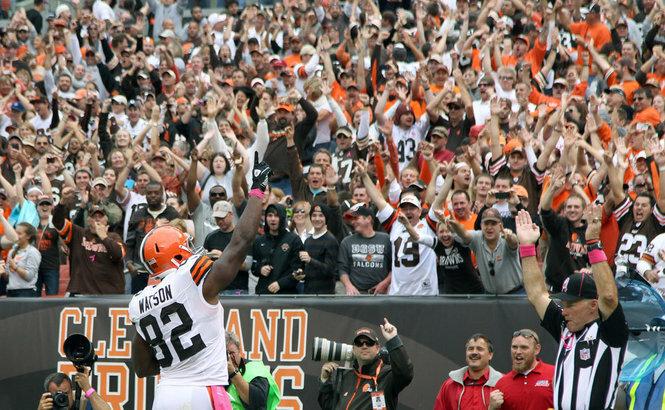 For the first time in almost a year, Cleveland work up Monday morning to a victory by the Cleveland Browns. Like most things in life, there was good and bad on display Sunday at Cleveland Browns Stadium, but for one day, at least, the Browns were able to overcome the bad and walk out with a win. In beating the Cincinnati Bengals, the Browns snapped franchise-record-tying 11-game losing streak, as well as a 12-game losing streak in the AFC North, and gaves Brown coach Pat Shurmur his first division win. Gordon caught his third touchdown pass of the season on Sunday and now co-leads the NFL in touchdown receptions among rookies. He is also second in receiving yards, only 11 yards behind Tennessee’s Kendall Wright – despite Wright having almost triple the number of receptions. The return of Joe Haden from his four-game suspension also elevated the play of the corner backs (even if it didn’t do anything for the tackling abilities of the safeties). According to Pro Football Focus, while Haden gave up seven receptions (in 10 targets) for 98 yards and a touchdown, he broke up two passes and also had an interception in the third quarter as the defense locked down the Bengals and bought the offense time to get its act together. Sheldon Brown obviously benefited from Haden’s comeback, as the veteran allowed just three receptions for 22 yards and had a pick-6 that helped seal the win. Even Josh Cribbs got into the act, returning a punt 61 yards (which only resulted in a Phil Dawson field goal, but still) and a 44-yard kickoff return. Things are certainly not perfect – especially considering the Browns are 1-5 – and if the Browns get too full of themselves they can easily drop their game this Sunday against Indianapolis. “All along I’ve talked about how I’ve seen this team improve and we all know this is a winning business so now we can quantify how this improvement points to winning,” Shurmur said. “So now once you’ve done something once then it’s important that you repeat it. Now the effort that I’ll put in will be about making sure that we continue the process and that work will be consistent. You try to recreate it all over and over and over. That sounds cliché, but that’s the issue. “When you lose it’s a team thing, and when you win, it’s a team thing. I’m very proud of those guys. Tthat’s why you play the game, to have this feeling. Now we’ll enjoy it here for a few hours, and then get back early and get ready to play the Colts.